In the enterprise, block storage typically handles the most critical applications such as database, ERP, product development, and tier-1 virtualization. 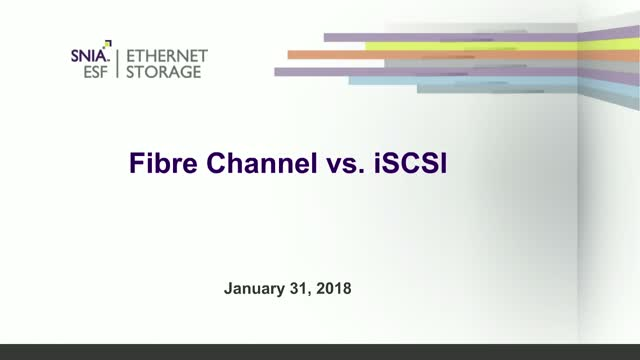 The dominant connectivity option for this has long been Fibre Channel SAN (FC-SAN), but recently many customers and block storage vendors have turned to iSCSI instead. FC-SAN is known for its reliability, lossless nature, 2x FC speed bumps, and carefully tested interoperability between vendors. iSCSI is known for running on ubiquitous Ethernet networks, 10x Ethernet speed bumps, and supporting commodity networking hardware from many vendors. Because, FCoE also delivers increasing performance as Ethernet speeds increase – and, Fibre Channel also delivers increasing performance as FC speeds increase. Historically, FC delivered speed bumps at a more rapid interval (2x bumps), while Ethernet delivered their speed bumps at a slower pace (10x bumps), but that has changed recently with Ethernet adding 2.5G, 5G, 25G, 40G, and 50G to the traditional 1G, 10G, 100G timeline. •Will Fibre Channel or iSCSI deliver faster performance? Does it depend on the workload? •How is the wire speed race going between FC and iSCSI? Does anyone actually run iSCSI on 100GbE? When will 128Gb Fibre Channel arrive? •Do Linux, Windows, or hypervisors have a preference? •Is one really easier [to install/manage] than the other, or are they just different? •How does the new NVMe over Fabrics protocol affect this debate? Join SNIA experts as they compare FC vs. iSCSI and argue in an energetic yet friendly way about their differences and merits of each.